While not as engaging as the Kia Soul and its hamsters, the Sedona spot drove significant search activity online and is above average within the iSpot.tv’s archives for online effectiveness in the industry. The brand’s media placement and corresponding engagement tell an interesting tale of successfully targeted creative. 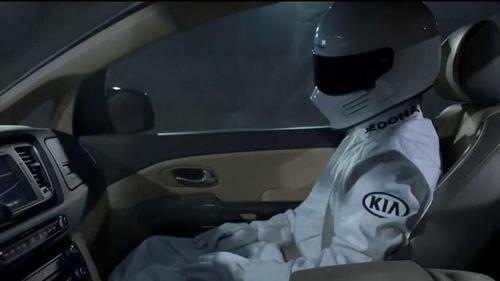 The commercial contains “Top Gear” inspired creative, in which Kia testers zip around a dark and lonely race track and evoke The Stig’s racing persona, but the speedsters relax and nap as comfortably as would a family on a summer road trip. Since first airing at the beginning of October, the new Kia Sedona commercial has already spent more than $6 million on national TV, which is just less than half of what the automaker spent since launching the new Kia Soul TV creative in late August. The buys are an interesting mix. There are a handful of expensive buys on big events, which typifies a reach play for audience size. More notably, there are many lower spend buys for niche events, which would give the creative more targeted exposure over many airings. In the case of this TV ad, the many airings on targeted networks and shows appears to be driving Kia’s online success. 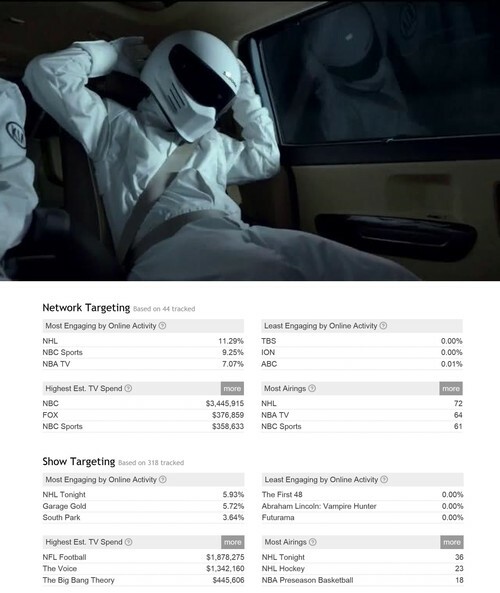 The majority of Kia’s airings over the last two weeks have concentrated on NHL, Basketball and gear-head oriented programming like “Garage Gold,“ while much of Kia’s spend has focused big events like NFL Football and two nights of The Voice; however, it is these media placement that have driven the majority of social and search activity around the brand and TV ad. Typically, the big TV events are more than capable of driving online activity, but in this particular creative may be more effective with targeted, niche buying. The creative approach appears to primarily resonate with those already engaged in similar show viewing. Early implications are that dollars spent around bigger viewing events may better leverage this particular creative with those dollars moving into more targeted buys and multiple airings. These are tweaks, mind you, to a generally effective spot. Kia consistently delivers online performance above and beyond what is standard in the industry. “It’s Not a Sports Car, It’s a Sedona” is another creative feather in Kia’s cap.